Did you know that you are rich? And I’m not talking theoretically rich. I’m asserting that you are, in fact, wealthy. 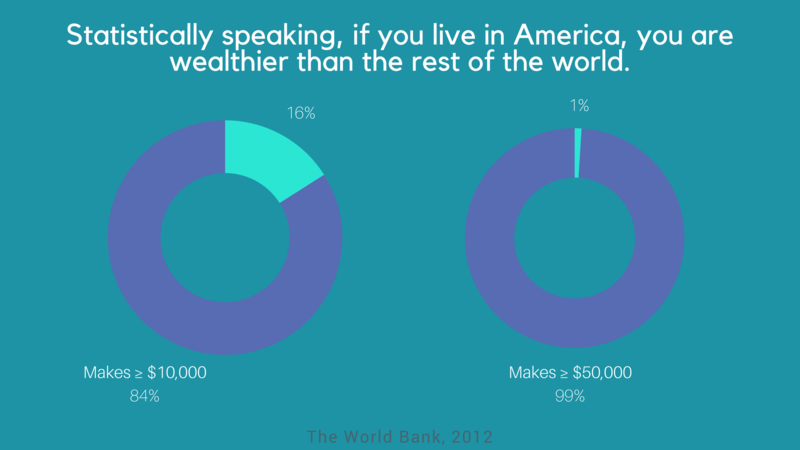 Statistically speaking, if you live in America, you are wealthier than the rest of the world. Check this out: if your family income is $10,000 a year, you are wealthier than 84% of the world. But if it’s $50,000 or more a year, you make more than 99% of the world (The World Bank, 2012). Our standard of living is ridiculously high around Seattle — especially on the Eastside. Kiplinger says that Seattle is the 10th most expensive city to live in the U.S., and the cost of living is 45% higher than the rest of America. We compare ourselves to those around us that are much wealthier than we are. We have a lot of debt. We worry about being able to provide for our families, pay our bills, and have enough for retirement. Let’s pause there for a minute. The key word in that last statement is worry. We worry about having enough. You may have had an experience(s) in your life where you didn’t have enough, or your family didn’t have enough, and you vowed to not allow that to happen again. So now your view of money is driven by fear, and when you think about giving you tend to give cautiously and frugally instead of generously. DO NOT be prideful about what you have. DO NOT put your hope in your wealth. 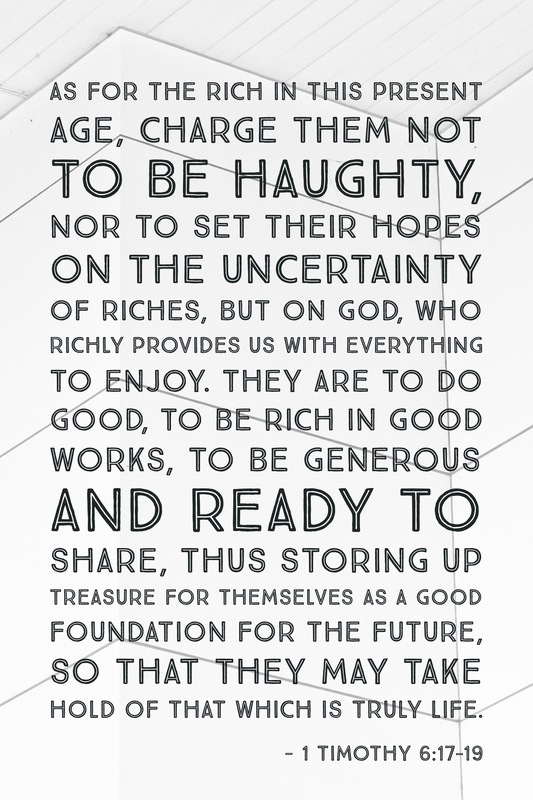 DO trust God by doing good, being rich in good works, and being generous. Why? So that you will be preparing for what God has prepared for you, and so that you will be fully alive. What a crazy thought. 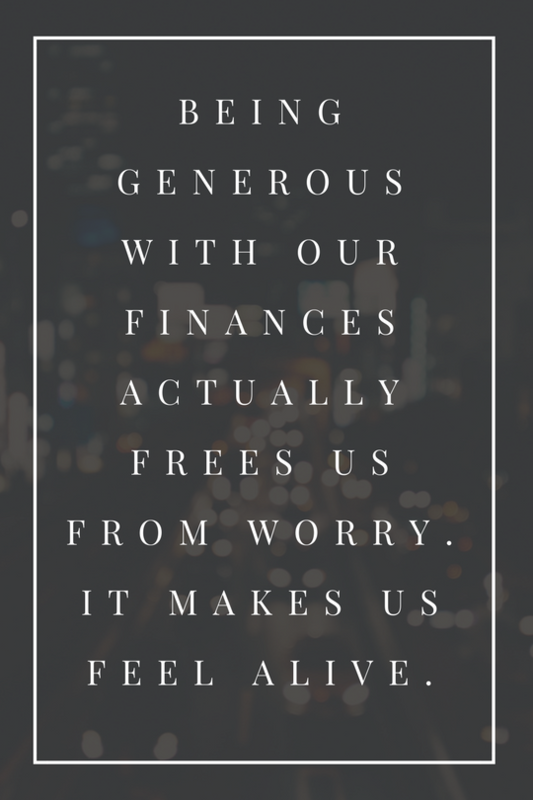 Being generous with our finances actually frees us from worry. It makes us feel alive. And in that way, it gets rid of our worry. I would guess that you are not greedy. In fact, you may give regularly to the church, to your sponsored child with Africa New Life, or to other organizations that mean a lot to you. But let me ask a question that only you can answer: Do you really give generously? Or do you give in a way that would be described more as careful, prudent, or controlled? There’s absolutely nothing wrong with being wise (in fact, it’s encouraged), but when it comes down to it, do you allow worry to drive your giving, or do you allow God’s word to instruct and inform how you trust Him to meet your needs when you give generously? Over the next few weeks at Imprint Church, we will be giving away a book called Fields Of Gold by author and pastor Andy Stanley. Please pick one up from the back table on a Sunday morning — one copy per family. This book was anonymously paid for by a family at Imprint Church who said their goal was “to inspire generosity at Imprint because sometimes it’s hard for churches to encourage people to be generous with their money for fear that it will sound like ‘please give us your money because we want it’…I think it being ‘grassroots’ helps people’s perception of it.” I’m grateful for this family’s generosity to inspire more generosity. Enjoy the book. It’s short and it will only take you 1-2 hours to read it, and it’s well worth your time. We will be talking about the book and generosity later this summer, and even more as we prepare for planting a church in 2018. May the vision that God has given Imprint Church — to make and multiply grateful and generous disciples through the Gospel of Jesus Christ — translate into our financial giving, as well.